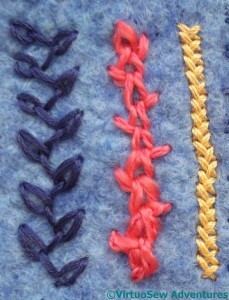 The first row was Fishbone Stitch in navy blue pearl cotton. I wanted something definite to create the edge of the panel. It was a little tricky to stitch on the soft pre-felt, but as I soon remembered – that would be true of all of them! Open Chain Stitch is an awkward stitch. In Barbara Snook’s “Embroidery Stitches”, she says it is best used as the basis for further ornamentation, such as single chain stitches across the bars. and I think you can see why. I used a pale yellow pearl cotton. I like the thread, but the stitch is one that needs more work! Next, Sorbello Stitch, worked in overdyed blue mercerised cotton. I’ve used this stitch before, to work the modern villages on the Map of Amarna, but at this larger scale the form and texture of the stitch is easier to see. Hungarian Braided Chain Stitch has become one of my favourite stitches since I used it for the Silken Crane and the Antelope Frieze. This version uses an overdyed pink/red pearl cotton. It does show colour variations nicely! Bonnet Stitch is a new one for me. I am absolutely sure that yellow rayon is not what the stitch was developed for, but it worked rather well, and I enjoyed it. I chose Feathered Chain Stitch next because I wanted something fairly wide, and fairly open. The navy stranded cotton makes a strong central axis for the panel. Petty Chain Stitch is a new one for me. I found it in one of the books by Edith John that I have. She named it after the student who created it by accident when she confused the instructions for two stitches – immortality of a sort, I suppose! I’ve used a pinkish wool slub, doubled to even out the thickness. I’ll try to remember to use this again, in a less textural thread. I think it could prove useful. The Herringbone Stitch, I chose because I wanted something narrow. You will have noticed I’ve tried to create a rhythm of stitch widths, although it isn’t a repeating pattern as such. The golden pearl cotton has a lovely shine. 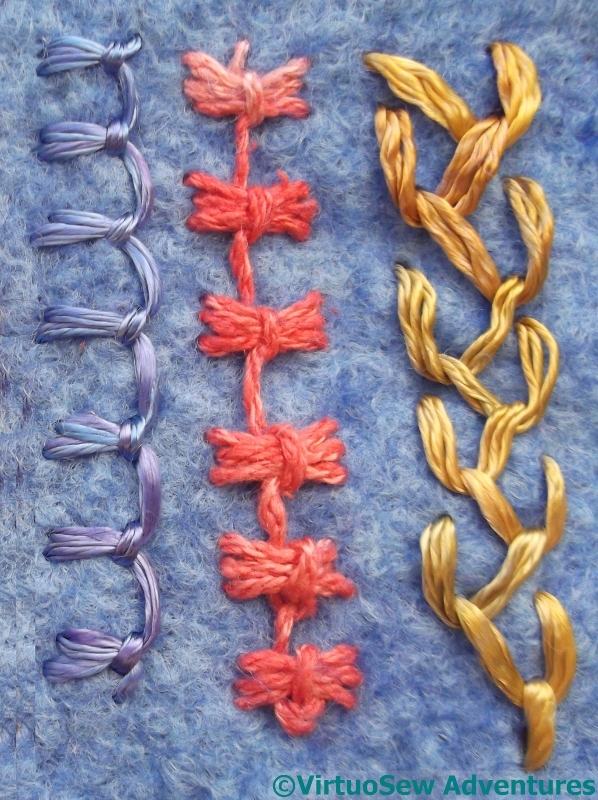 Up and Down Buttonhole Stitch is another old friend. The challenge with this blue overdyed rayon floss was not in the stitching, but in wrangling the fifty or so metres that joyously tangled themselves as soon as I untied the skein! I’ve never used Butterfly Stitch before, either. I’m not sure that the textured pinkish cotton does it the best service, but it creates an interesting effect. Feather Stitch is harder to stitch well than you might think. The de-twisted gold rayon cord certainly didn’t make life easy, but it helps create an emphatic stop at the end of the panel. 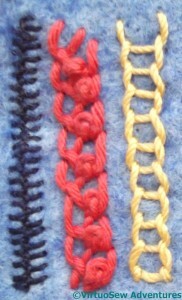 A great variety of lovely stitches. lots of new to me stitches! Thanks for sharing, I really like the sorbet stitch. Do you have a book you could recommend with instructions? sorry I typed sorbello but it autocorrected to sorbet!! Lots of reminders there for when you’re trying to decide what stitch to use. My favourites are the up and down buttonhole and the butterfly stitches. I, too, have found feather stitch more difficult to stitch than it looks! Sadly I had never heard of many of these stitches before. 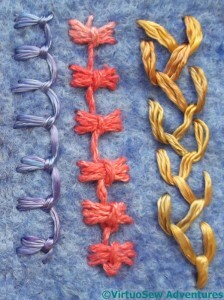 I love them all but my very favorite is the Mountmellick Thorn Stitch. Hmmm or maybe the Sorbello Stitch oh no, it might be the Butterfly stitch… They are all so very lovely its hard to choose. Some new stitches to me, as well. Like Penny, I love the Mountmellick Thorn Stitch. I’ve been playing with the up and down buttonhole lately, but now I want to try some of the stitches you’ve shared that are new to me! A really nice selection of stitches. Love the Sorbello stitch and up and down buttonhole. I find Feather is one of my less favoured as it seems to go where it wants…. 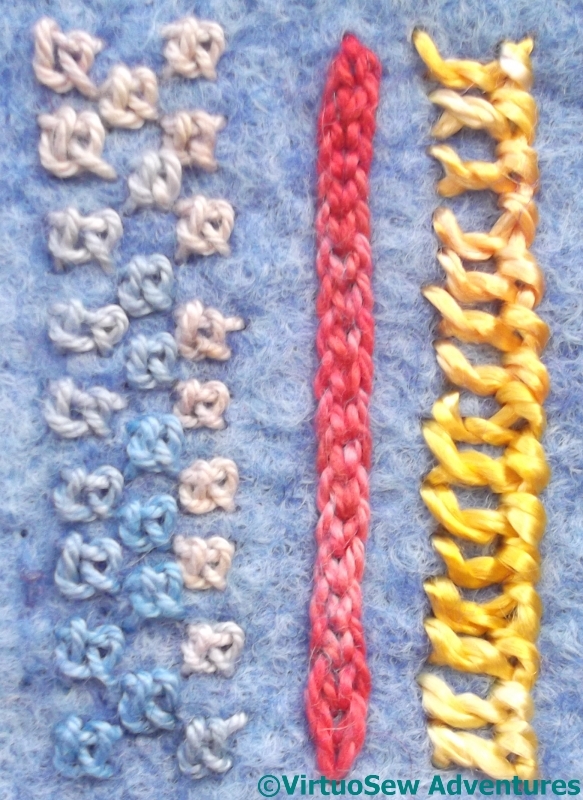 Two of these are totally new to me, too: Petty Chain, Bonnet Stitch – where did you find that one? I don’t know it. 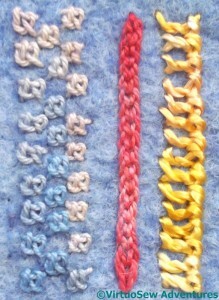 Hungarian Braided Chain is one I’ve already taken into my repertoire of really useful stitches (thanks, Mary Corbet!). I’ve never found a use for Sorbello, although I have seen it used like cross stitch to work out charted designs. The Feather family I like best as counted stitches, it keeps them tidy, but they are very useful. Your selection has something for everyone, and I hope you will find it inspiring yourself. What a good idea, to have the stitches where you will see them regularly. All are old favourites, rather like a box of chocolates for the eyes. Nice to know some more about the names of stitches. gorgeous sampling Rachel…I am particularly enthralled by the Sorbello stitch, I may have to reacquaint myself with that one. Thanks for giving names to all the various stitches on your sampler tool case. Many of these are ones I’ve never seen before or if I have, didn’t know the names. And thanks for linking up your Sea tractor post to last week’s Stitchery Link Party. I love all the details and the different stitches and textures. I also like how you stitched the water’s edge to look like wavelets coming in.